Experienced Premier League referee Kevin Friend has been placed in charge of Manchester City’s Carabao Cup fourth round tie with Wolves on 24 October. 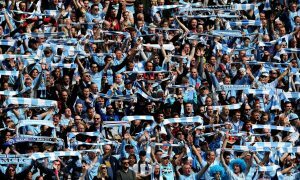 It will be the 46-year-old’s first City match this season after he was appointed four times last season, most recently the 2-2 draw with Middlesbrough on 30 April. Prior to that he oversaw wins over West Ham and Watford, along with the other draw against Middlesbrough which saw Marten de Roon score in injury time. City’s clash with Wolves will be their fourth game in ten games, all of them at home. So far, the Blues are two out of two with wins over Stoke and Napoli, with Burnley next followed by Wolves. Pep Guardiola would undoubtedly like to win the Carabao Cup but considers it a “waste of energy” compared to the main competitions and is expected to give many of his fringe players a start when Championship leaders Wolves arrive at the Etihad Stadium next week.